My kids have grown out of the desire to hunt hidden treasure with their father, but luckily I have grand-kids who are the age my boys were when we started geocaching. We took them out camping for the first time this year and they wanted to make sure we took some time to hunt the elusive Tupperware. Going out with them brought back memories of why I enjoyed geocaching so much. The chance to get outside, walk around, but mostly to visit places and vistas you most likely would not have if not for the sport. We traveled quite a few back roads, up some hills, through some boggy roads, and saw some gorgeous country. Great fun. It is that time of year again! On Saturday, June 29-30, 2013 the three cities of the Tri-Cities are once again hosting a Geocaching Challenge that awards those who complete their quest a 3-part coin. This will be the 4th GeoCoin Challenge to be put on in the Tri-Cities and it should be a doozie. Find 10 geocaches in each of the 3 cities, Richland, Pasco, Kennewick, to earn each of the three trackable geocoin puzzle pieces. You must find all 30 geocaches to complete the puzzle. Geocoins are limited. There are only 300 trackable geocoins per city. Once they are gone you will have to try again next year. Was fun to get together last night with a room full of geocachers for a white elephant gift exchange. It brought back many memories since it was held at the site of our original cache meetings way back in 2002. I have cut way back on my geocaching addiction but there a better group of people to hang out with and what a clever ‘log’ for everyone to sign. I just sent out this e-mail to all the cachers that I can contact east of the cascades. Of course we would love to have anyone join us. Those of you who know me (and that isn’t many) know that I have a motto that I always live by: “Anything worth doing is worth overdoing”. Well I fear that is what I have been doing with the East Cascade Geocaching Society. I wanted something informal, simple and relaxing, so that I didn’t have to put in a lot of work on it. Well… I did right the opposite. I tried to find the perfect meeting place, in the perfect city, at the perfect time to meet everyone’s needs. Man! That’s a lot of work. So, (at Sugar’s insistence) I have come to the understanding that “it’s time to get the show on the road”. So let’s get rolling. Beginning November 07, 2002 and on the first Thursday of every month thereafter, we will hold Geocaching Therapy Sessions at Sterling’s Restaurant in Richland, Washington (N 46deg 16.724min; W 119deg 16.403min) from around 6:00 pm until around 9:00 pm. Bring yourself, your spouse, your non-geocaching friends, your kids, but not your dog (unless it is a guide/assistance dog). Sugar and I will probably eat while we are there, but it is not a dinner gathering. I talked with the manager and he is cool with people just getting coffee, pie, snacks, etc. He is NOT reserving a table for us, so we will just fill in as we arrive. They have a section that is rather isolated and ideal for a group to just sit and talk. Once again, nothing formal, nothing planned, just a chance to meet each other and chat. I want to put in a special note for the under 18 crowd (especially my friends from Oasis School), this is for YOU TOO! So, be sure you try to attend (with or without your parents)when you can. I am going to put a post on the geocaching.com forum so maybe we can draw a few travelers in while we are at it. If you know of a local geocacher that isn’t included in this e-mail, feel free to forward it to them and ask them to drop me a line so I can include them in future mailings. What a fun day! 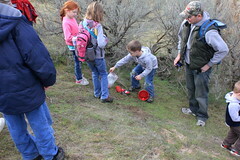 My two oldest grandsons and I met up with more than 30 others to caravan out to Juniper Dunes to hunt down 4 geocaches, one of them hidden 10 years ago this April. The event was organized jointly by the Richland and Pasco Parks and Rec departments. This cache was hidden on April 11, 2001 but will not be posted on the internet until we return home to Utah sometime this weekend. We have enjoyed our visit to Washington. It’s beautiful here. It hasn’t been the best of weather but that’s expected for this time of the year. We live in a small rural town in Utah named “Stockton”. The population is approximately 600 people. If you should find this “cache” we would very much enjoy hearing from you as I don’t foresee us ever returning to Washington. The remoteness of this cache is evident in that after 10 years fewer than 130 people have logged the cache and half of those have been since May 2007 when the ‘Washington History Challenge Cache‘ was published, challenging people to find caches hidden before geocaching.com’s first birthday. When the challenge cache was published there was a flurry of folks from western Washington visiting the cache so they could claim bragging rights. 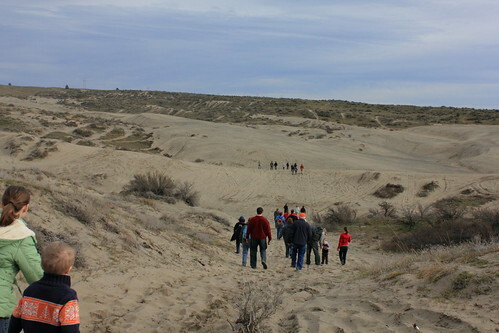 More photos of our Juniper Dunes Geocache Expedition are on Flickr.